Welcome to KNCO Swap Shop - Nevada County’s On Air (and On-Line) Garage Sale! Posting items for sale or items you want is fast and simple. To post items for sale you have to register, to shop no registration is required. You can find some posting tips by clicking here. Swap Shop is heard live on KNCO Newstalk 830, join me weekdays from 3 to 5 pm weekdays. Saturday mornings Pat Day hosts Swap Shop from 8 to 10. To be a part of the live radio show call 477-5626 when the show is on the air. I look forward to hearing from you then. The only way to get your items on the website is for you to post them here. 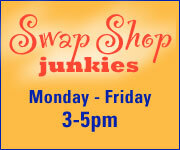 It’s time to put The Power Of Swap Shop to work for you! There are some rules for Swap Shop and here they are: 1) No Business please, 2) No Real Estate, 3) No Weapons, 4) No Chemicals, 5) No Alcoholic Beverages, 6) No Employment Opportunities. Thanks for playing by the rules!